Academic Focus Areas are related majors that are grouped together because they share a foundation of common course requirements and recommendations. At most institutions, every program of study will fit into one of a limited number (five to eight, generally) of Academic Focus Areas. There is considerable power in using focus areas to guide students’ choice of program, particularly for students who enter college uncertain of their options or how academic programs align with career interests or skills. There is substantial evidence that when faced with too many options individuals are unable to choose. Historically in higher education, with dozens if not hundreds of majors and programs to select from, many students have deferred this choice, opting to be undecided as they began their academic careers. Focus areas establishes a “choice architecture” for students to reduce the number of choices required into a manageable number that provides meaningful differentiation and opportunities for further refinement as the student garners more information. 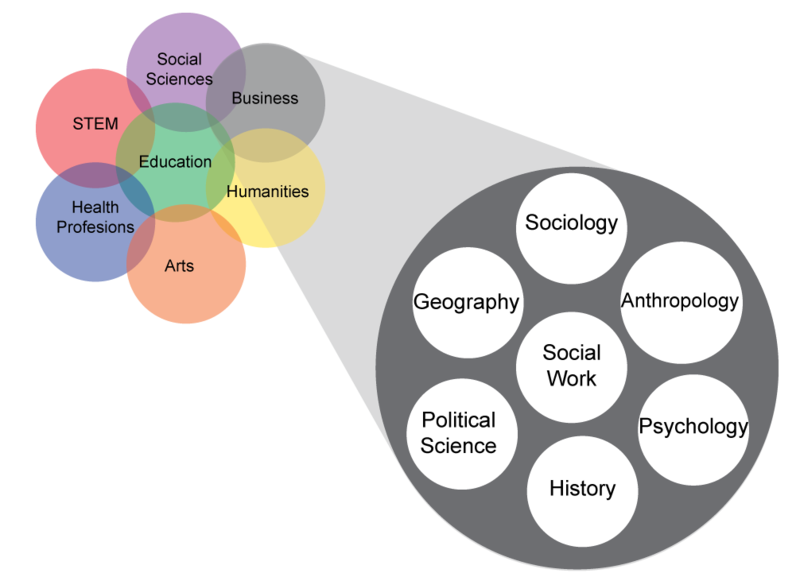 The illustration below provides an example of how programs of study might be grouped into Academic Focus Areas at an institution. 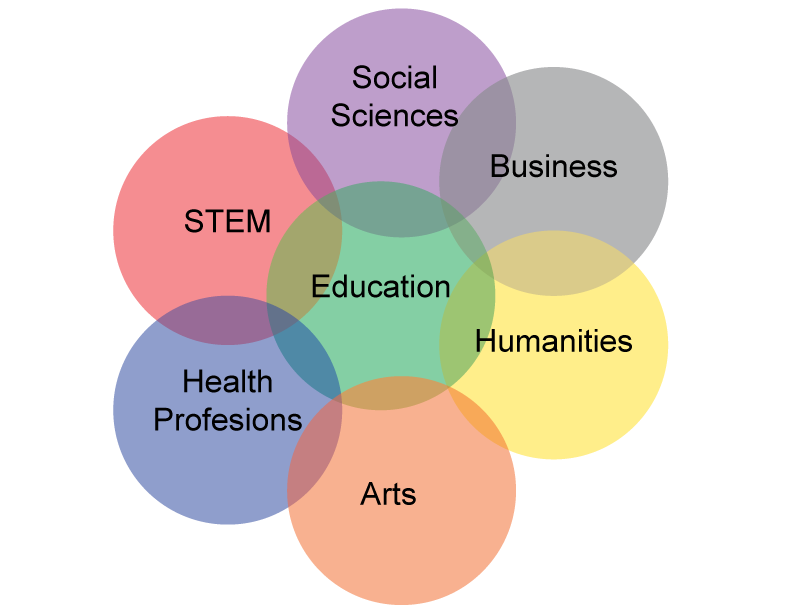 Within each focus area are clustered related majors that have mostly overlapping first year course requirements and closely related competencies. For the example above, the Social Sciences focus area at this institution includes seven distinct programs of study. The requirements and recommendations for courses will typically be similar within a focus area for Areas A – E of the USG Core Curriculum, and there may also be overlap in some of the program-specific requirements (Area F). Because of this, students matriculating without a clear idea of a specific major or program of study can be directed to take courses in an Academic Focus Area in their first semester that are likely to count toward graduation, even as they are refining their ideas about their majors. Students who enter college with a specific program of study or major in mind will automatically be mapped onto a pathway appropriate to both the specific major and the associated program of study. Students who enter college without a clear choice of program will be helped to identify the Academic Focus Area most closely aligned with their broad interests, and to explore potential programs of study or majors in the Academic Focus Area within their first two semesters of enrollment. Placing students in Academic Focus Areas will also help to identify related majors in the event that students wish to switch majors. Focus areas will replace undecided as an option for students. Students who are undecided about their program of study will need to meet with their advisor to make an informed decision about an academic path that begins with an Academic Focus Area and supports their goals, skills and interests. As a result of this conversation, students may select a degree program directly or may be guided into an academic focus area if they remain uncertain as to a specific area of study. By eliminating undecided as an option for students who enroll in classes, the University System is taking a concrete step to ensure that every student has an opportunity to become informed of their options at the institution they have chosen to attend and how those options connect with their purpose for pursuing a college degree. A key component of the Momentum Year is that students should enter college making a purposeful choice of an academic focus area or a program of study. Many students select a major at the point of application or during the process of registering for courses and proceed through their academic program on the path toward that degree. Other students may enter college undecided as to the program that they wish to pursue or unaware of what the options may be. For both types of students, and those in between, the initial choice of a major is often made from a position of limited information about the nature of the field, the expectations of the program, or the connections with student aptitudes, interests and skills. The consequences for students of entering and having made a program choice that does not align with their interests and abilities may be numerous major changes, lost credits, discouragement, or stopping out. In the University System of Georgia, students who graduate typically earn almost 20 credits above those required for a degree, adding nearly a year’s worth of course-taking into the transcripts of students who succeed. Academic focus areas help to minimize the likelihood of excess credit by ensuring that within a focus area most courses a student is advised to take in their first year will apply across all related programs. Focus areas further help students as they advance on their path in their chosen area to refine and recalibrate their academic goals so that they make an informed final choice of a degree program that connects with their interests, skills, and goals. 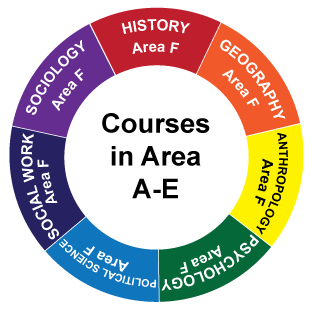 Students who identify a degree program upon application are automatically in the focus area in which their program falls. This allows them to fully understand their choice and provides opportunities to explore more deeply both their own program and those that are closely aligned. Focus areas can allow institutions to group students into affinity groups in order to provide targeted curricular and co-curricular opportunities, help support more tailored advising, and can be used to reinforce students’ purpose and sense of belonging to the institution and their program. First Year Experience courses, core math or English courses, or other academic experiences can be tailored to support career and academic development for students in particular focus areas. Students in the same focus area can form learning communities with aligned schedules, creating small groups of students with similar interests in several classes together, amplifying the sense of belonging, helping to create connections with other students and faculty.